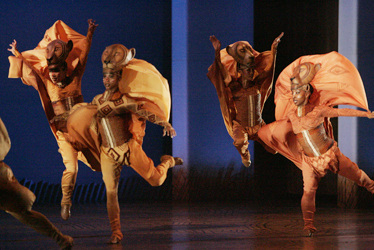 Performers dance to a number called the "Lioness's Hunt" as Disney's "The Lion King" opens at the Blaisdell. Disney's "The Lion King" sold out its opening performance last night at the Blaisdell Concert Hall as nearly 2,000 people, including many families with young children, finally got to see the show they waited months for. They were treated to a stage extravaganza that bustles with African music, Western pop sensibilities and overwhelming puppetry with both Javanese and Japanese influences. So elaborate were the costumes and makeup that audience members could barely recognize the performers from their head shots in the program. Before the show, the excitement was palpable among those waiting in line. Craig Katsuyoshi, whose late grandmother was owner of Helena's Hawaiian Food, wanted to watch his younger sister, Iolani graduate Charlaine Katsuyoshi, perform as the only cheetah in the production. She also has about 14 costume changes. "It's going to be great," he said. "She's a great performer. I'm just proud of her. I just came out to see her dance." Annette Ishitani went with her 12-year-old daughter, Kara, and about 20 co-workers from Castle & Cooke Homes Hawaii. The two had manicures and went out for dinner together before the show. "The whole day's been centered around this," she said. 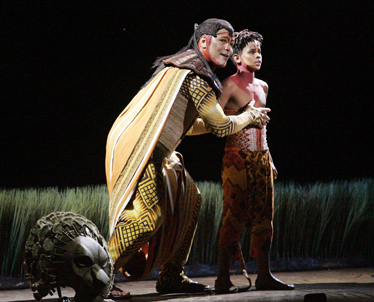 Mufasa (Geno Segers), left, and Simba (Trevor Jackson) performed "They Live in You" at yesterday's opening performance of "The Lion King" at Blaisdell Concert Hall. Brandon Talania, who has seen Broadway productions in New York and Hawaii, said bringing the production to Honolulu was a positive event for the community, particularly with the extended show dates. "It's exciting," said his daughter, Brandalyn, 6, although she expressed some trepidation at the "big-headed lion," Scar. Said her dad, "It'll be amazing for her to see the animation and bringing it to life. She has no idea what's in store for her." "We're doing it as a family," said Maty Beasley, of Kapolei, who bought tickets when they went on sale last spring. "It's just an amazing production," said her husband, John Beasely, who saw the show with his wife in San Francisco two years ago. "It's an incredible production of people in motion. You're going to leave and say, 'Wow, that was amazing.'" Liz Scheidecker bought tickets early because she was afraid seats would be gone. She went with her son, Cody Marvin, 5. "It's our date," she said. "I know he'll enjoy it." She plans to see the show again in November when her fiance, who is in Iraq with the Army, returns from duty. "I like the animals that they bring out. I like the jaguars," said Cody Marvin, who added that his favorite was the baby lion, Simba. 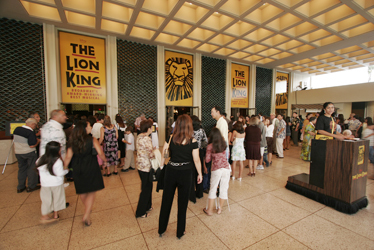 Theatergoers lined up to enter Blaisdell Concert Hall for yesterday evening's performance of "The Lion King."